we will hold a new event tomorrow evening, 4th of October. please check and join from all over the world. 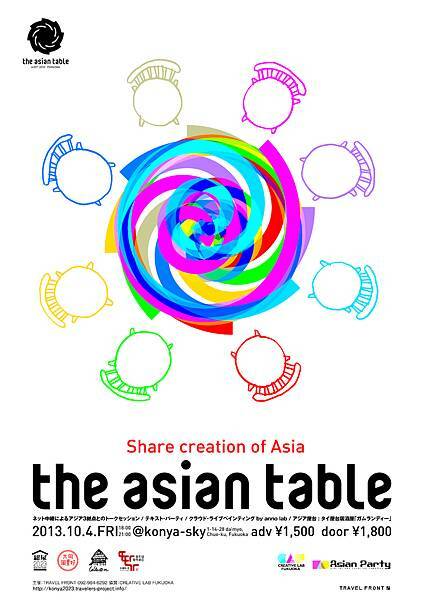 "the Asian TABLE" is a imaginary table that people share Asian creation. On this "TABLE", various "current trends" of creation of many parts in Asia will be arranged. and hold a talk session about art scene / economy / society / the possibility of the Asian TABLE in casual mood. The talk will be conducted almost in English. And our recommendation creator "anno lab" will make a fresh attempt to "cloud-live-paint". You can join in the virtual party site ( Google document, spreadsheet ) on the website with writing or cut & paste. 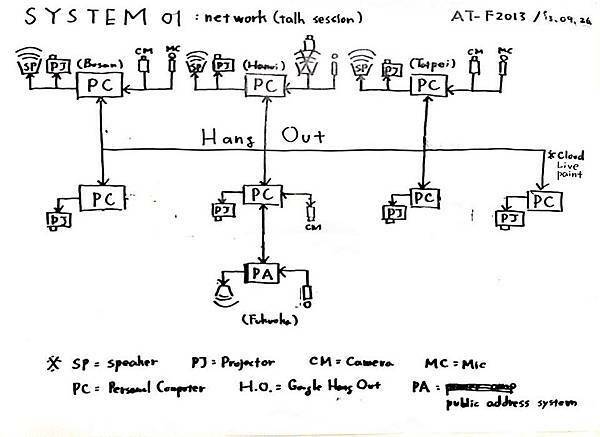 Everyone can participate in this party from everywhere, if only you are connected to the internet and sign in. It is like a chat, but more creative communication. Not only for exchanging the feeling or impression at the moment in each languages, you can just enjoy playing catch with texts and images each other. The communication there would cross over the difference of language. 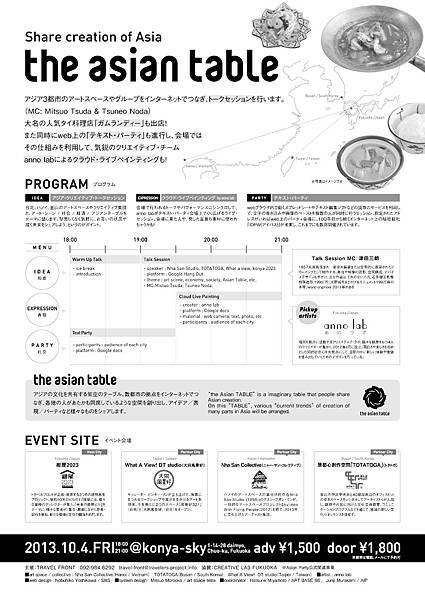 *This time you can participate only at the real site of the Asian TABLE. Live-painting on the 'text party' site by the creative team "anno lab". They will use the photos taken in each participant city as material, and demonstrate the live-painting on the Google docs and spreadsheet as canvas. This performance will be run in parallel with talk session, so sometimes it would be affected and synchronized with the site's atmosphere, what is talked at the moment. "gamlangdii" is Thai restaurant near konya2023, certificated by Thai government's 'Thai Select'. They serves traditional Thai home made dishes with organic vegetables and herbs. Nhasan Studio is the first and the longest artist run space for experimental art in Hanoi. Nhasan Collective is their new space, located in an abandoned pharmaceutical factory right in the centre of Hanoi. Nhà Sàn COLLECTIVE is not a museum, a commercial gallery or an international culture institute where completed works are presented by established artists. and have chances to meet with international artists, curators. including fine art, sculpture, photograph, performance, cinema, literature, music and so on. TOTATOGA's 27 studios located between jungang-dong and Donggwang-dong, where are historical district in Busan. This project started in 2010, now 311 artist are crating art and making community with citizen in their studios. Located in Taiwan,aiming to join the people and sharing the ideas together by means of photography & traveling since 2010.
anno lab is the creative labo based in FUKUOKA city ( the primete city of South Japan ). anno lab is established by Alumni of Kyushu University who have different careers on April 2012. Our mission is making amusing world by creating new experience and value which stimulate intellectual curiosity. He considers sculpture to be an element of space composition, and creates stage art, modeling art of movie and device design. ｍain works are special modeling art "August in the water" Director Sogo Ishii 1995, monument"MADOKA"Onojo city Madokapia 1997, wood engineer "xylophone"NTT Docomo CM 2011.etc.